WASHINGTON - President Donald Trump's former campaign chairman, Paul Manafort, will learn Wednesday exactly how long he will spend in prison when he faces a judge to be sentenced for the second time in less than a week. 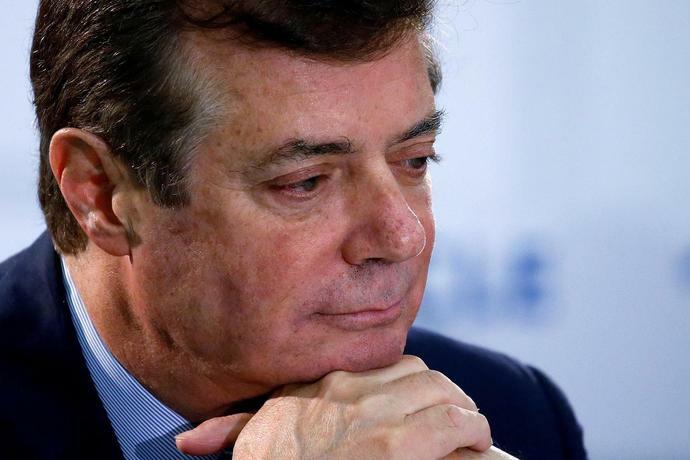 A federal judge in Virginia sentenced Manafort to 47 months in prison last week for a scheme to defraud banks and taxpayers out of millions of dollars. U.S. District Judge Amy Berman Jackson in Washington could add 10 years to that total when she sentences Manafort on Wednesday in a related case. Manafort pleaded guilty to two felonies in Washington as part of special counsel Robert Mueller's nearly two-year investigation into Russian interference in the 2016 election. It will be up to Jackson to decide whether whatever punishment she imposes runs at the same time as the Virginia prison sentence, or whether he must serve them one after the other. Jackson's decision will determine whether the soon-to-be septuagenarian would spend a significant amount of his twilight years behind bars. The pair of sentencing hearings marks the end of Manafort's abrupt transformation from a globe-trotting political operative with mansions and lavish clothing to a frail-looking, wheelchair-bound, gray-haired inmate who, in his own words, had been "humiliated and ashamed." Prosecutors have urged Jackson to impose a significant sentence, describing Manafort as a "hardened" criminal who "repeatedly and brazenly violated the law" for more than a decade and whose crimes continued even after his indictment in 2017. Defense attorneys have said a lengthy prison term would likely amount to a life sentence for Manafort, who turns 70 in less than three weeks. They said Manafort's crimes do not rise to the organized crimes of drug cartels, and that the charges aren't about "collusion" with Russia, which was the central focus of Mueller's investigation. U.S. District Judge T.S. Ellis in Virginia heeded defense attorneys' call for leniency on Thursday, when he sentenced Manafort to nearly four years in prison and three years on federal supervision for masterminding a scheme to defraud banks and taxpayers out of millions of dollars he had amassed through years of illicit lobbying work on behalf of a pro-Russian political faction in Ukraine. The sentence fell far below the 20 to 24 years that federal sentencing guidelines had recommended. Jackson has given few signs that she will be similarly sympathetic. Jackson revoked Manafort's bail last summer following allegations that he tried to obstruct the Russia inquiry while on house arrest. She sided with prosecutors last month that Manafort violated his plea agreement by lying repeatedly to prosecutors and the FBI after promising to cooperate. "I would be even more surprised if her sentence reflected the sort of leniency that Judge Ellis showed," said Ken White, a defense attorney and former federal prosecutor. "I think she views him as someone who acted badly during the course of the case ... I would be very, very worried about this next step if I were Manafort or his lawyers." Ellis' sentence surprisedsome legal experts and was promptly met with backlash, particularly from Democratic lawmakers. A USA TODAY analysis of the U.S. Sentencing Commission's data found that Manafort received the type of sentencing available only to people who cooperated with the government. And his 47-month punishment is lower than those of many defendants whom prosecutors deemed as cooperative. Manafort's lawyers have asserted that he cooperated with the special counsel, citing about a dozen interviews with prosecutors totaling more than 50 hours. But prosecutors disputed that that amounted to cooperation, saying Manafort had failed to provide useful information and had lied to investigators and to a grand jury. The analysis found that of the nearly 67,000 defendants sentenced in federal courts in the 2017 fiscal year, 308 whose guideline calculations called for them to serve at least 15 years in prison wound up receiving less than five years. The majority of these defendants received this kind of break in sentencing because the government asked for it and because they cooperated with prosecutors. Manafort, whom prosecutors did not believe substantially cooperated, received a sentence below that. In fact, of those 308 cases, there's was one fraud case in which the sentence was comparable to Manafort's. It involved a defendant in New York who faced a recommendedminimum of 188 months and was sentenced to 30 months. Jackson is also presiding over the case of Roger Stone, another Trump adviser indicted as part of the Mueller investigation. Last month, Jackson found herself in the national spotlight after a picture of her next to what appeared to be cross hairs was posted on Stone's Instagram account.